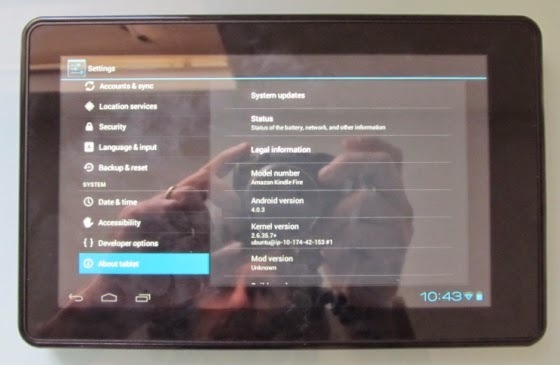 Developer JackpotClavin has released a very early build of Android 4.0 for the Kindle Fire. It’s based on CyanogenMod 9 and right now it’s very buggy. This release is really aimed at developers who can help improve on JackpotClavin’s work, not the general public. Audio isn’t fully functional yet and video also doesn’t work, and I’ve noticed some graphics glitches. In the meantime you can check out the video below to see what ICS looks like on the Kindle Fire. Liliputing posted detailed instructions for installing Android 4.0 on the Amazon Kindle Fire. Bear in mind this is still an early build and not everything works properly. We also take no responsibility if you damage your device, so proceed with caution. You’re a developer and you may have some ideas for how to fix the remaining bugs and improve the overall experience. You’re insanely curious and want to know what ICS looks like on the $199 tablet. If that doesn’t scare you off, the process for installing Android 4.0 is pretty simple, follow Liliputing's instructions and good luck!